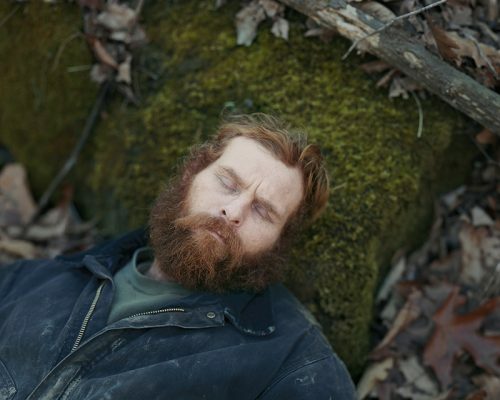 Hypnagogia is the latest exhibition in Dublin’s Douglas Hyde Gallery and features the work of much acclaimed photographer Alec Soth. This new show has been gather together from the American’s previous bodies of work – including Broken Manual, Sleeping by the Mississippi and 2015’s Songbook. When presenting a selection of single images from previous series you always run the risk of an exhibition where the whole is not greater than the sum of its parts. This difficulty is navigated and avoided through two key elements within Hypnagogia. Firstly the careful curation of the works within the space, and secondly the themed narrative which the works displayed share within Soth’s past projects. If you visit this show, curiosity will invariably draw your eye to the left of the main space when you leave the bottom of the staircase. Presented is a large format wall print featuring a self portrait of the artist in Tokyo. This dwarfs the first of a trio of smaller pieces to its right, entitled Sleepwalker. This begins a journey that sees 19 images interwoven together and featuring a variety of framing, sizes and dates. Around to the right, and in the sunken section of Gallery 1, are five black and white portraits featuring a man, 3 sheep and a falcon. Initially these pieces seem to jar with the aesthetics of the other images but it is here that the second key element of the show rings loudest. Soth advises that the works presented communally refer to Hypnagogia – a 19th century term that explores the heightened creativity experienced in the state between wakefulness and sleep. This focuses the viewer’s critical eye and sees a strong body of single images become a cohesive and equally strong exhibition. There is an element of macabre and humour and these help blur the lines between fantasy and reality and enhance the dreamlike state proposed by Soth in Hypnagogia. Any remaining shackles are lifted and the viewer is free to explore their own narrative and journey within the images – a journey that ensures that this exhibition is greater that the sum of its parts. Full details on the show are available here. Originally published on The Thin Air as part of the Picture This series.